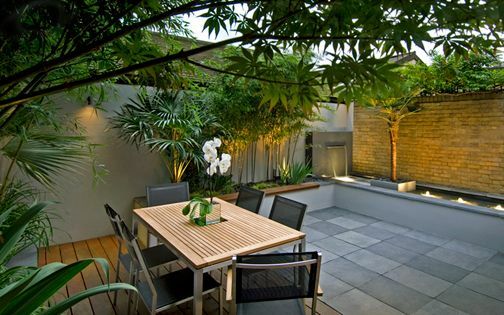 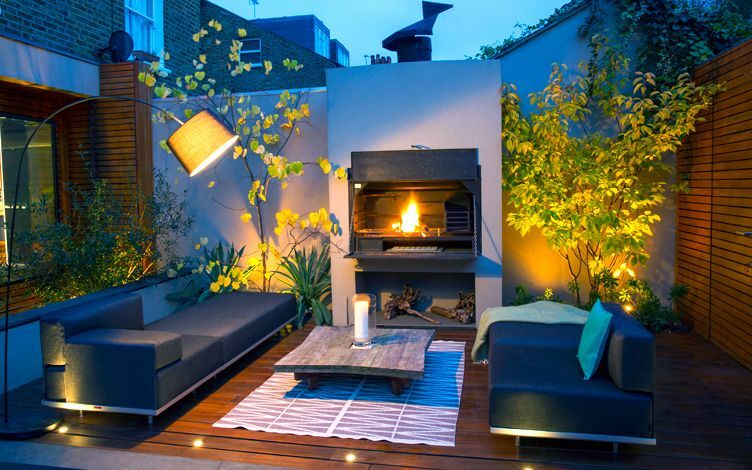 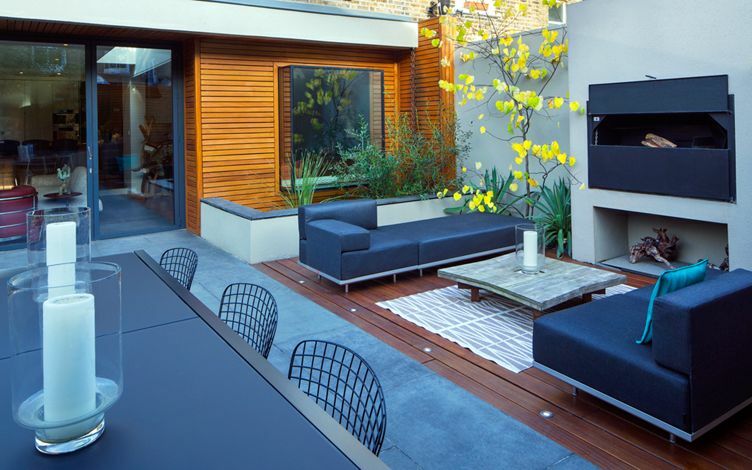 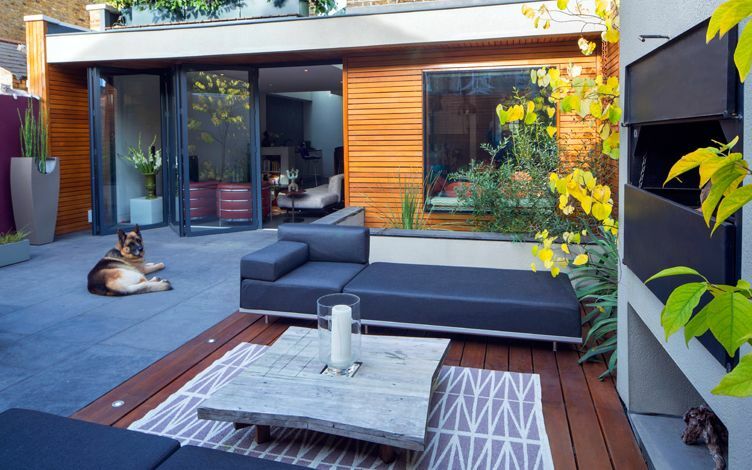 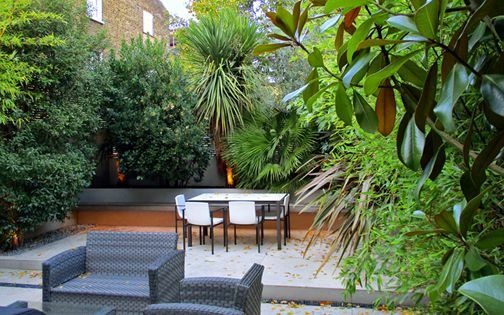 Modernising this Clapham townhouse had reshaped its garden into a static square, markedly reduced in size. 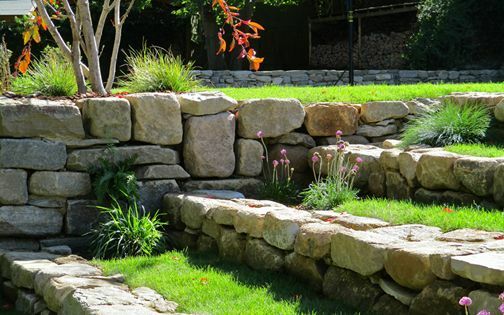 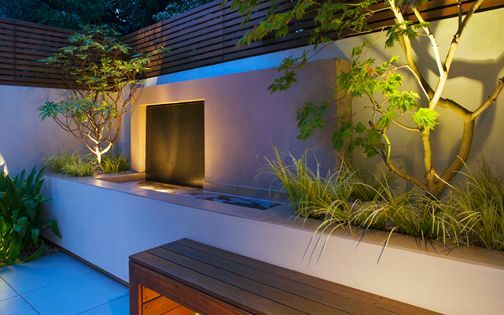 The re-landscaping challenge encompassed a functional garden design framework, accentuated by architectural clarity, indoor-outdoor fluidity and all-year-round use. 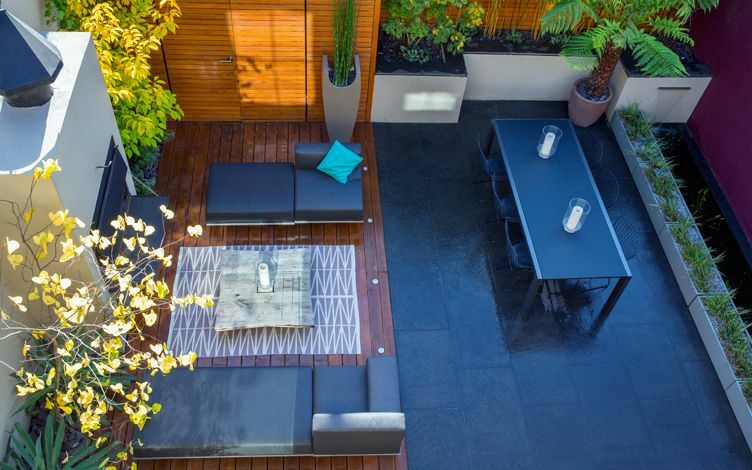 Expansive basalt flooring links an open-plan living room into the 50-square-metre town garden to create a cohesive continuum, while a built-in oven and a bar concealed as storage extend versatility with elegance, where dining outdoors forms an engaging ambience. 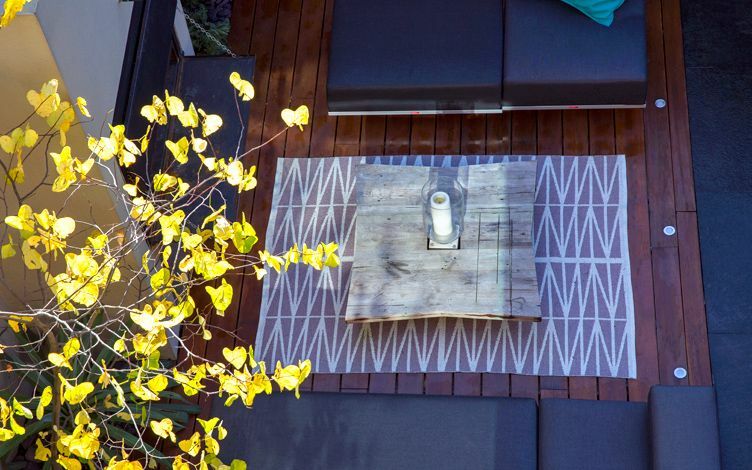 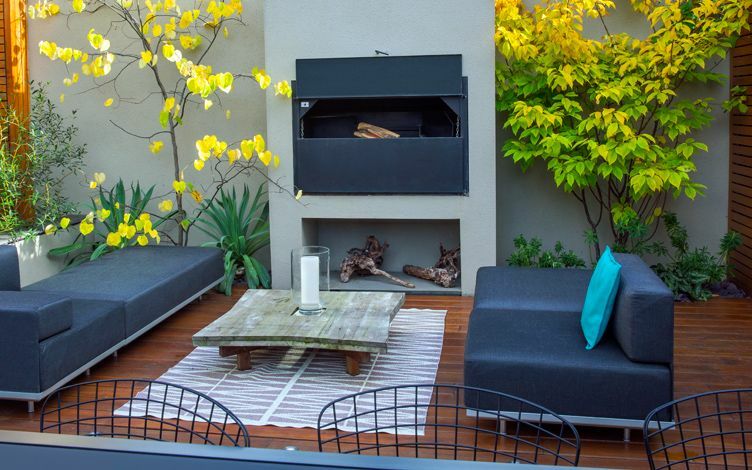 With our clients' flair for cutting-edge design and conceptual art, steeped in entertainment gusto, the young couple's outdoor space was skilfully transformed into their home's most exciting room. 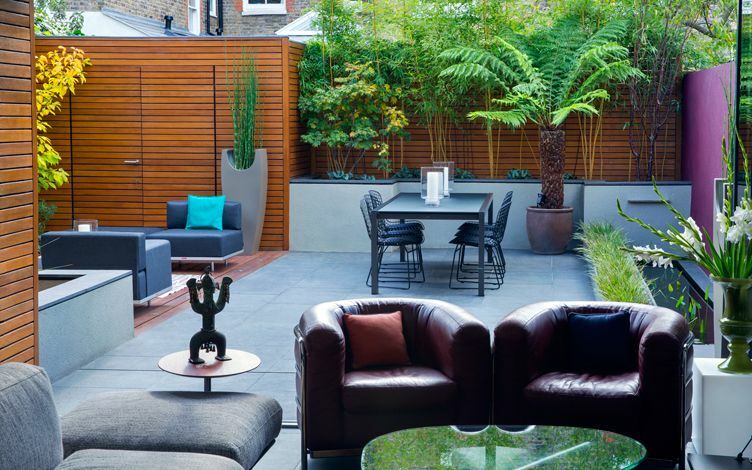 Part of a multidisciplinary team, we infused colour, architectural planting and bespoke vases in a high contrast layout to maximise the garden, amid a sumptuous exterior full of liveable modern amenities. 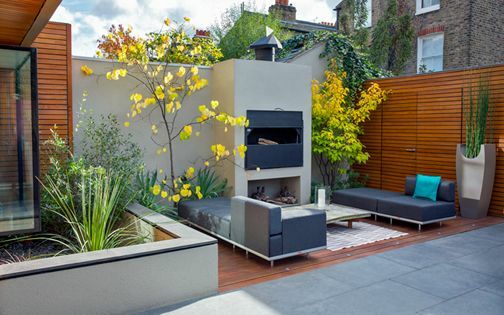 Kitted up with an in-situ stove, covered bar and diverse seating zones, this well-organised town garden is equipped for frequent use through the seasons. 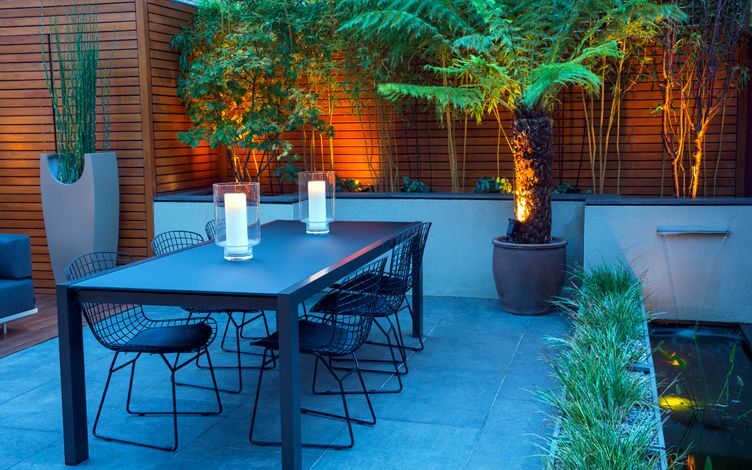 Utilising our extensive roof terrace design techniques, the new rooftop's vantage point provides a vista of the garden's entire outline – immersed in subtropical leafiness and exuberant lighting. 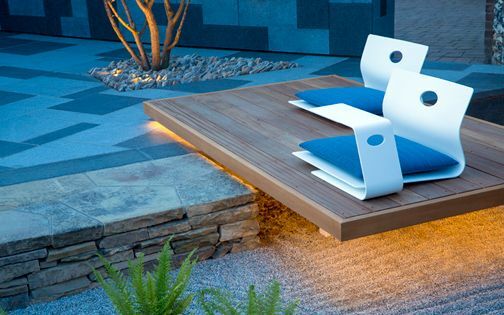 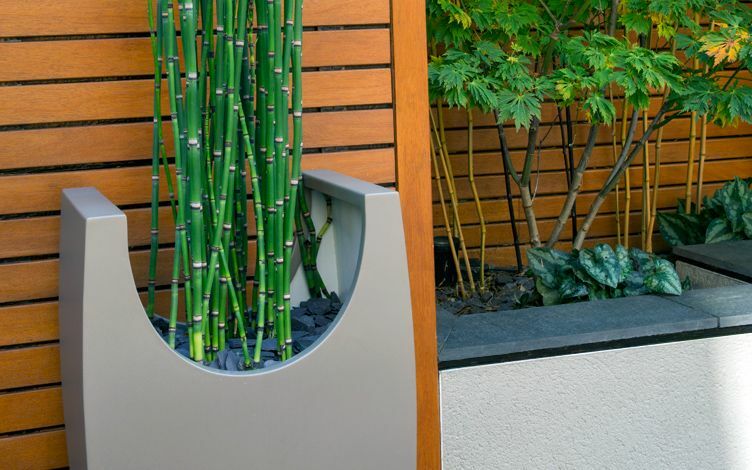 A minimalist, natural material palette forms a three-dimensional design composition, increasing sense of space in this small town garden. 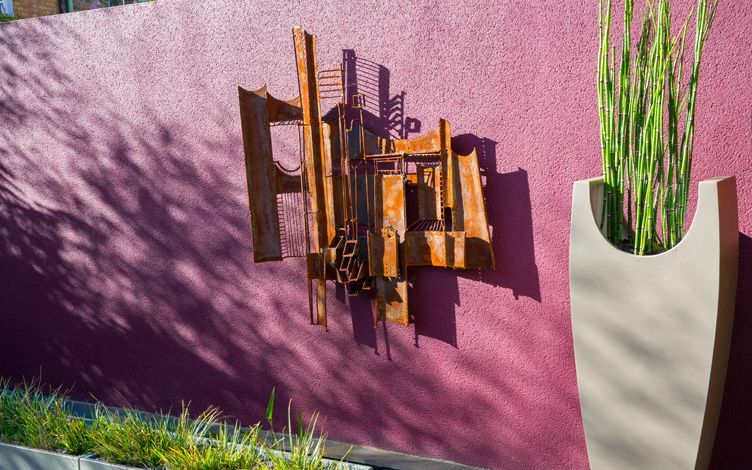 Layered with off-white rendered walls and a deep maroon sculpture wall, daylight refinedly enhances the setting's dynamic garden design details. 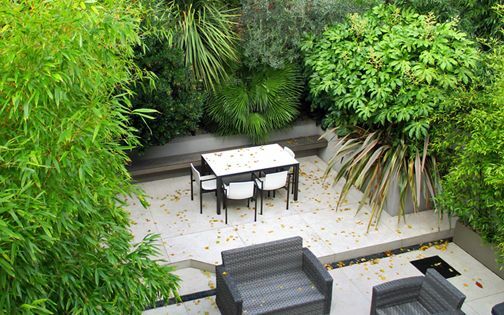 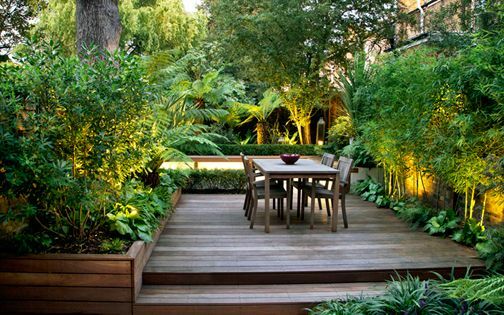 Oriented north to south, the garden's layout benefits from a multilayered design which utilises floras from Asia, Central America and the Mediterranean, balanced in distinct habitat zones. 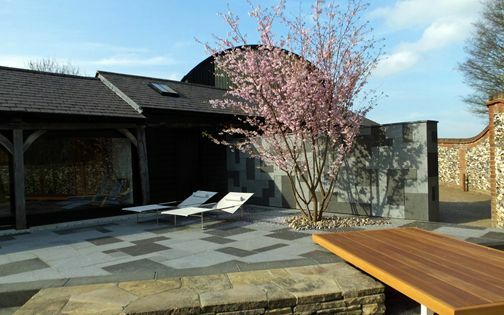 A Tibetan Cherry tree, Bamboos, Ferns, a Japanese maple and Sweet flags provide focal points further from the house, while Sotol, Spurge and Mexican lilies soak up sunrays closer to the living room. 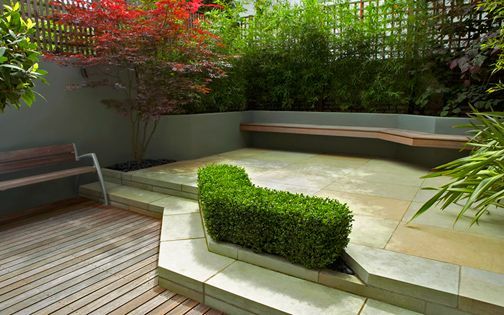 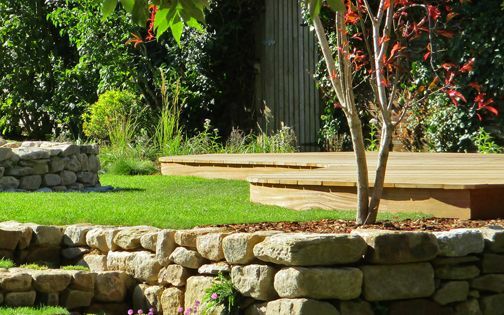 The balanced layout forms renewed perspectives, maximising depth in such a small garden design, where varied stone and wood nuances produce refined detail, fusing a vibrant, lived-in outdoor room. 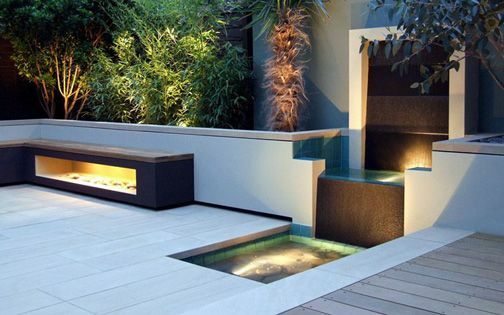 This fluid modern garden design sequence extends the interior through a multitude of handy amenities by generating four unique elevations; the squared garden is rejuvenated amid alternating sculptural focal points, enriched with stylish detail, clean lines and a warm colour palette. 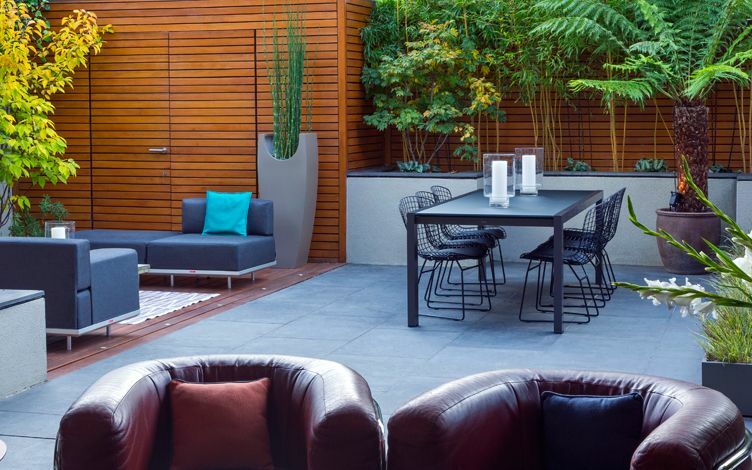 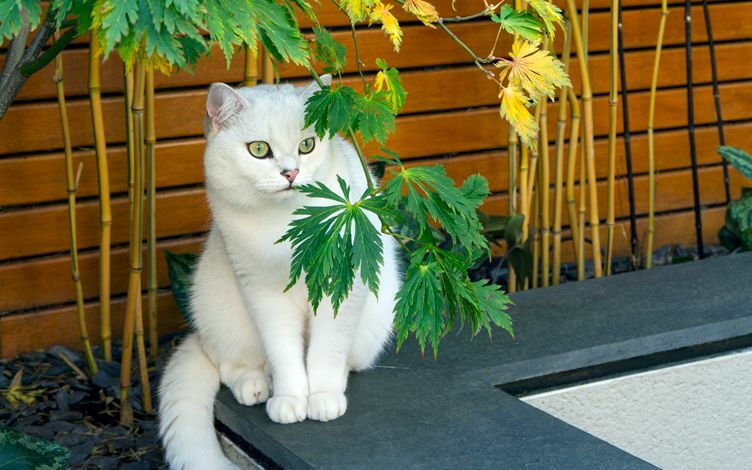 Enhanced by a definitive courtyard ambience, the refreshed garden design sustains abundant cooking, entertainment and dining areas to form an intimate socialising hub – defining a modern town garden lifestyle which is manifestly low in its maintenance routine. 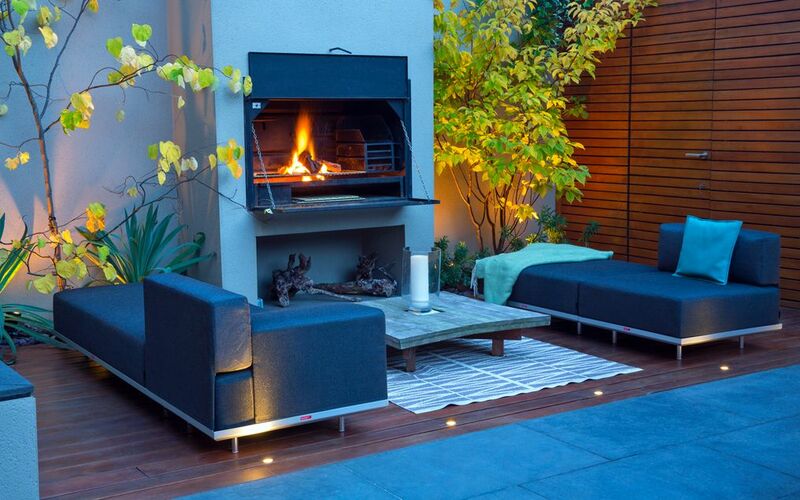 Lounge seating is situated by the built-in outdoor oven, adding functionality and comfort. 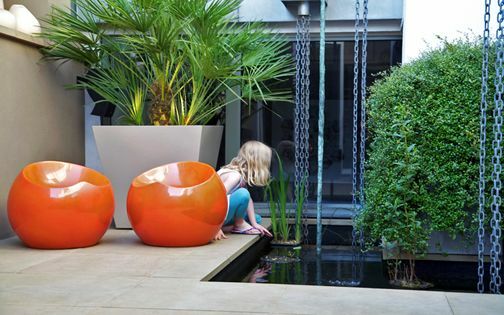 Perched across basalt paving opposite, a dining furniture set is arranged along the water rill with a maroon wall backdrop featuring modern sculpture, and benefits from aquatic resonance and lush Tree fern canopies; sunlight enhances the texture of an avant-garde artwork, while sedges in troughs define the runnel's perimeter. 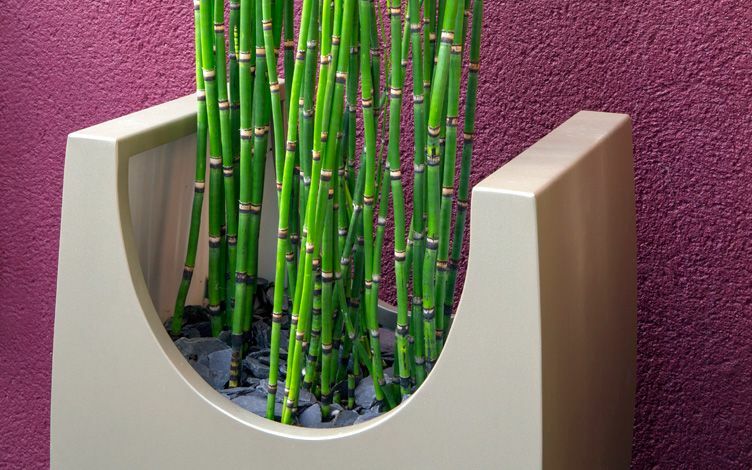 Striped Horsetails in a pair of custom-made curved vases produce evergreen architectural verticality, where an abundance of finely detailed bespoke elements generate distinctive character to articulate a fully renewed modern town garden in South London.